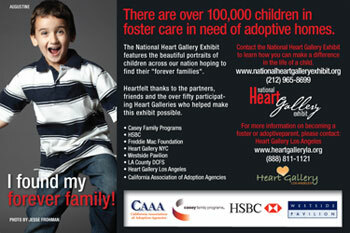 The SC Heart Gallery and the SC Heart Gallery Foundation are thrilled to bring the NHGE to South Carolina! The exhibit is being hosted by the Chapman Cultural Center in Spartanburg, SC, from July 9 - August 24. A special reception was held on Thursday, July 19th, 5-9 pm EST, coinciding with the downtown Spartanburg Art Walk. The National Heart Gallery Exhibit was in Iowa! With support from Iowa KidsNet, the Exhibit was displayed on two floors at Valley West Mall in West Des Moines May 9th – 15th in honor of National Foster Care Month. Iowa KidsNet held an opening launch and press conference at Valley West Mall on Saturday, May 12th at 1:00 p.m., on the main floor in the Center Court area. Senator Chuck Grassley (R-IA) and other foster care and adoption advocates spoke at this event. Senator Grassley is a co-founder of the Senate Caucus on Foster Youth and key advocate for legislative issues related to foster care and adoption, and Iowa KidsNet is a statewide collaboration of agencies that utilizes a unique, cohesive approach to provide recruitment, training, licensing and continued support to individuals who wish to become foster and adoptive parents. This event was free and open to the public. The Exhibit then traveled west to Sioux City, Iowa, where it was displayed at the Sioux City Museum from May 17th – 30th. For more information, call 1-800-243-0756 or visit www.iowakidsnet.com. Click here» to view large poster. Posters from the National Heart Gallery Exhibit were on display during Congresswoman Karen Bass' launch of the Congressional Caucus on Foster Youth’s 2012 U.S. Listening Tour. The bi-partisan congressional caucus hosted its first Foster Youth Town Hall, Saturday, February 25, 2012, from 10:00 a.m. – 12:00 p.m. at the California Science Center, Donald P. Loker Conference Center, 700 Exposition Drive, Los Angeles, CA, 90037. The Indiana Department of Child Services and the Indiana Heart Gallery proudly presented the NHGE in Indianapolis, in time for the Super Bowl! It was displayed at the Indianapolis City Market, an historic icon in the city, located right in its center. Thousands of people had an opportunity to view the Gallery and raise their awareness about the children in foster care and the need to find loving, forever families. The NHGE traveled back to Capitol Hill for a one week display in the Russell Senate Office Building Rotunda. The NHGE exhibit was on public display at Tysons Corner Center in the DC area, the 11th largest mall in the country. The National Heart Gallery Exhibit launched in Washington D.C.